Bolivia! Bolivia was always the ultimate destination of this trip, and you’ll see why as we continue through the series. We left off at the overland border crossing at Desaguadero, where it took us five hours to successfully get into Bolivia. As a result of the delays we suffered, we were extremely behind schedule, especially if we wanted to see much more of Lake Titicaca. We had to be in La Paz very early the next morning, and by the time we successfully crossed we only had about four hours of daylight left. Our options were limited. In order to see anything of the lake, we elected to take a dirt road loop, which our map showed getting pretty close to the water. It wasn’t quite what we expected, but it was still worth travelling. In many places, the road was densely lined with one row of trees. These trees were more decorative than natural (this area is a farming plain) but it was still pretty. 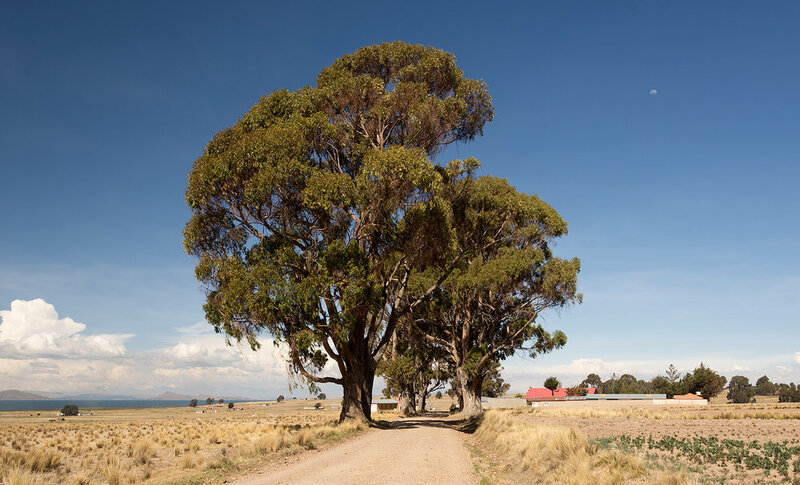 It’s not exactly the spectacular scenery of Lake Titicaca you’ll see in other pictures, but it was still worth the time. At times you could see the mountains surrounding La Paz, the only snow-capped Andes we’d see until we returned to La Paz a week and a half later. Having finished our loop, we decided to make it an early night in the village of Tiahuanaco, which is situated about halfway between the border crossing at Desaguadero and La Paz. 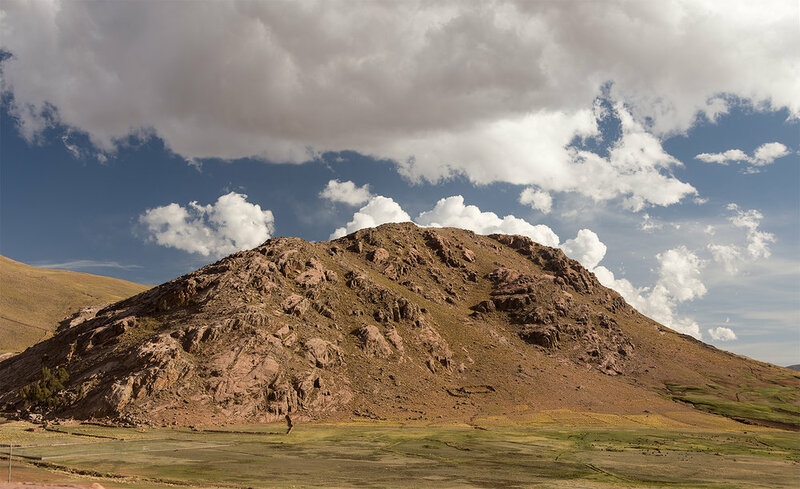 Tiahuanaco, also known as Tiwanaku, is famous for its Pre-Columbian archaeological ruins, dating back to BC times, when the city was the capital of one of the most important pre-Incan empires in South America. You wouldn’t know it by looking; now it’s a quiet village with two restaurants and maybe 200 people. Had we actually known the nature of this place, we probably would have visited the ruins. Instead, we were after food and a bed. Below is the town square and the restaurant where we ate dinner. Shortly after, we entered El Alto, La Paz’ twin city. El Alto is what most people think of when they think of La Paz, partially because that’s where the airport is. El Alto is home to 900,000 people and is one of the highest major cities in the world, located 13600 feet above sea level. While La Paz has modern road infrastructure (including one of the only four-lane freeways we saw on the trip), El Alto does not. Instead we had to dodge tangles of cars and pedestrians, even before 7 on Saturday morning. Note Huayna Potosi in the background. While driving through the city center, one thought dominated the rest: “who decided to build a city here?” A lot of cities are built in geographically unkind places, but La Paz may top them all. 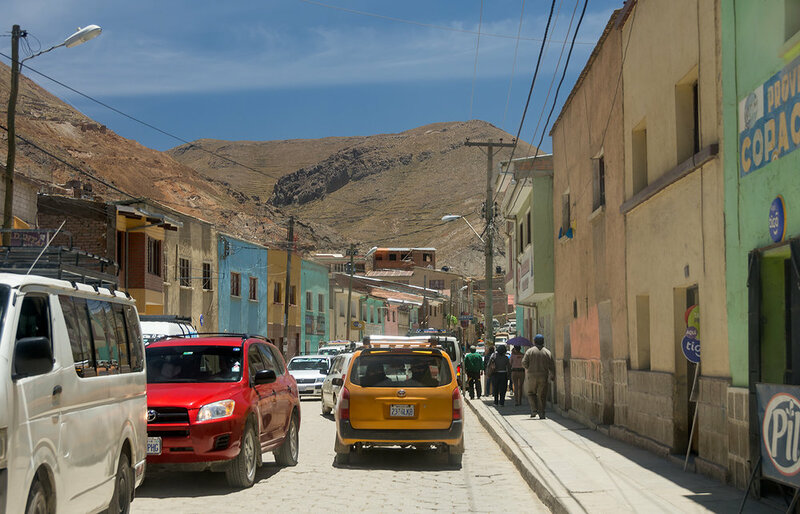 El Alto is 13600 feet above sea level, but the La Paz city center, directly adjacent, is 1700 feet below that. 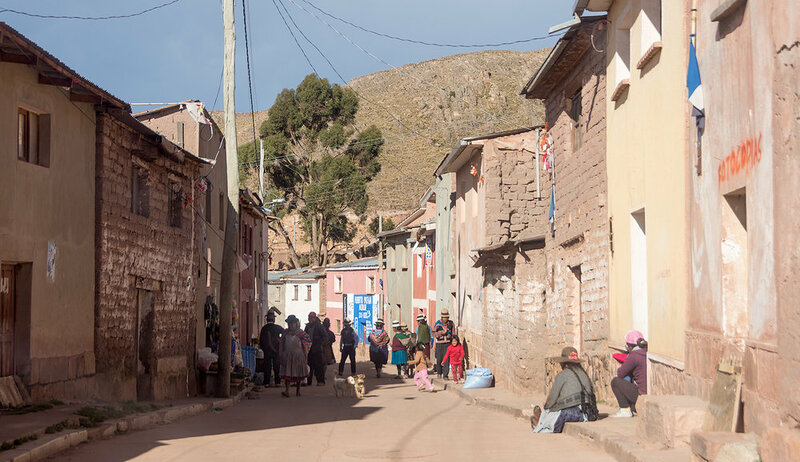 As a result, much of the infrastructure transitioning between the second and third-largest cities in Bolivia are focused around getting people up and down the massive hills and valleys. 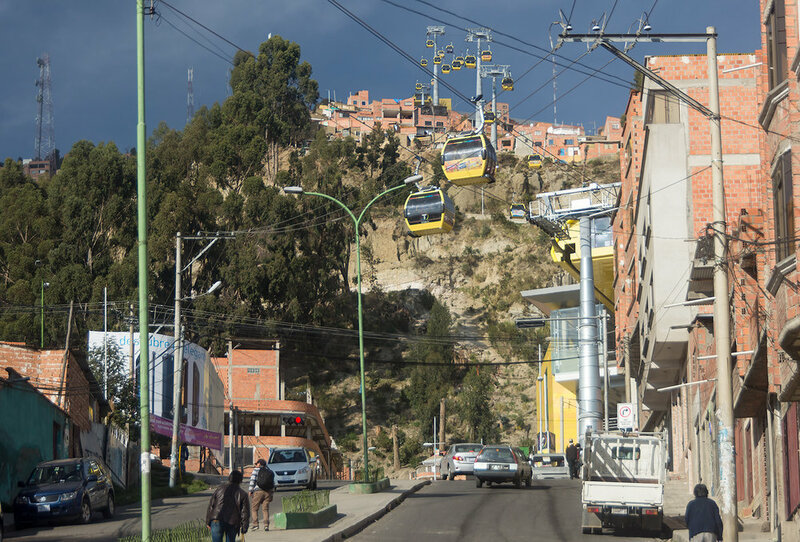 Pictured below is the brand new cable car system which moves passengers from La Paz to El Alto. Building a subway between the two vastly different elevations would have been all but impossible, so they went above ground instead. The cable cars do not have a high passenger capacity, but several new lines are being planned to increase the passenger capacity. Near the cable car station we pulled into our appointment with Aldo. Aldo is the man who ran Petita Rental Car, from which we rented our vehicle. For years, Aldo had run Petita as a rental business for courageous/stupid travelers like Jake and I. Want to rent a car for three weeks, drive it for 5000 miles, take it into four different countries, have all of the paperwork done in advance, and be equipped for surviving in the middle of nowhere like us? Aldo was the person for you. He’d even let renters drive from La Paz to Ushuaia, the southern tip of South America, and leave the car there. This trip would not have happened without Petita Rental Car; it was the only business we found in dozens of hours of research who would let us do what we wanted. In the weeks following our trip, Aldo sold his business. We were some of his final customers. 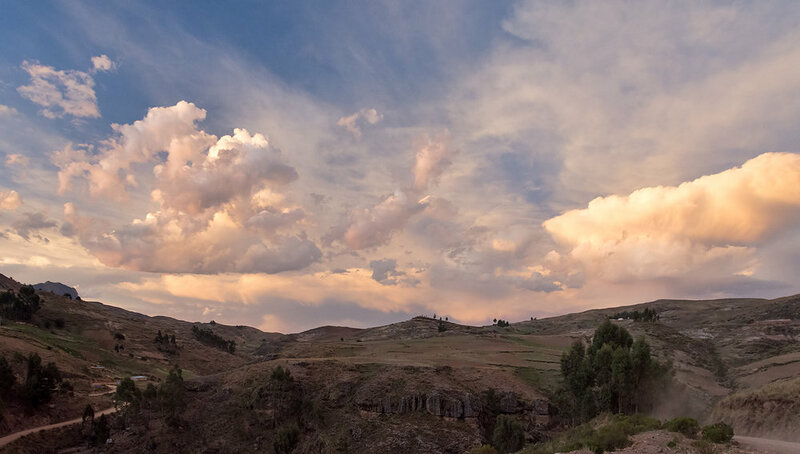 The new owner (who Jake met when he picked up the car) has moved the fleet of Nissan Patrols to Cochabamba, South America’s new home for adventure driving rentals. The primary purpose of our visit with Aldo was to check on our oil pressure gauge, which we noticed was broken a few days ago. Aldo was unconcerned about the gauge and could not fix it. He also adjusted the timing of the engine, since we were having trouble starting it when it was cold (the fix did not help much, since our issues were more due to the engine being carbureted). In the hour or so it took to do this, I played with Aldo’s dogs. We hit the road a couple hours later than expected, heading south on Bolivia Route 1, the same which brought us into La Paz earlier. 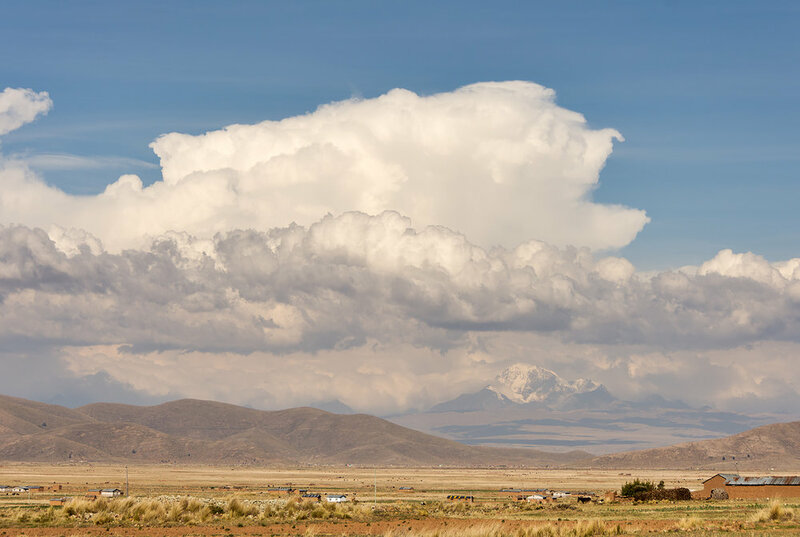 The route heading south is very modern; a dual carriageway between La Paz and the industrial city of Oruro. We were heading towards the city of Sucre, where we were planning on meeting Jonathan, a friend Jake met while buying and selling license plates on the internet. 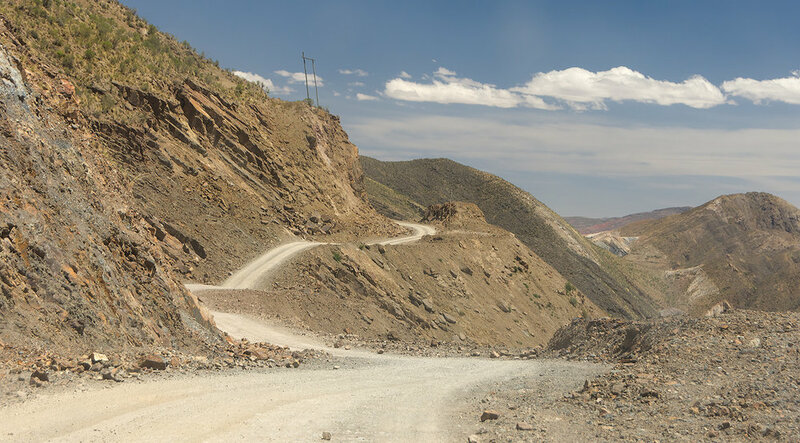 The section of ruta 1 between La Paz and Oruro looks like high deserts in most parts of the world. When I was young my family would drive through the Mojave Desert in California a few times per year. It looks like that. The only difference: in California, a “high desert” is 3000 feet above sea level. In Bolivia, it’s 12000 feet above sea level. At this point, we are off of ruta 1 and onto ruta 6, a supposed shortcut to Sucre. This is the colorful village of Huanuni. Both ruta 1 and ruta 6 will get you to Sucre eventually, though ruta 6 is a more direct route and the stretch we took of ruta 1 was pretty boring. We thought the new route would be a change of pace. Aldo, Jonathan, and our map told us the whole road was paved. The first few miles were promising and matched what we were told in advance: rolling hills, sweeping turns, good scenery. Almost perfect, really. There was still a nearly 150 mile stretch of unpaved road and really bad construction zones. It seems that our information was premature. Ruta 6 is not paved now, but in a few years it probably will be. This would have been good to know beforehand as our drive, which was supposed to be an easy cruise, turned into a bumpy, exhausting mess. Ruta 6 becoming a more direct through-route between La Paz/Oruro and Sucre will probably have a significant impact on towns such as this. It may not ever become a truck route, since that’s what Ruta 1 is for, but they’ll have to deal with more tourist idiots like us. About 100 miles into our unplanned dirt road journey, we got stuck. Due to heavy construction ahead, the road was temporarily closed. We had to wait for about an hour for the road to be clear again. During the wait we practiced our Spanish with the construction worker blocking the road and the truck driver who was waiting in front of us. The location of the closure would have been beautiful without the construction tearing up the river bank. It probably still was. Finally clear of the construction zone, we started down the home stretch towards Sucre. At this point, things were getting … interesting. 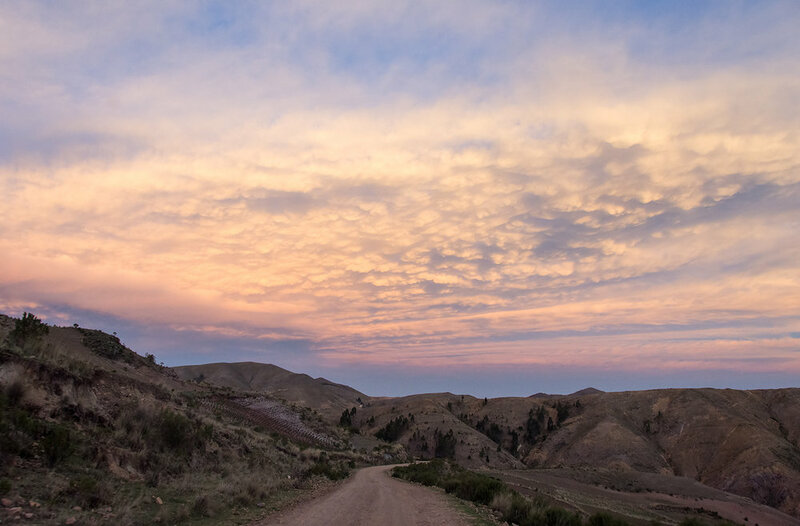 As the sky started to glow, we forgot that the thundercloud and the mammatus clouds on the horizon meant that we might have to deal with this terrible road being wet. We forgot about the prospect of driving the final 50 miles of this road at night. We forgot that we were four hours late to our appointment with Jonathan, and that we had no cell service with which to cancel. We just had to stop and stare, long-term planning be damned. Here in the US, Texas is famous for having a “big” sky. To be honest, I never really knew what that meant. How can a stationary object be big? The sky is the sky, right? It was at this moment that I understood. 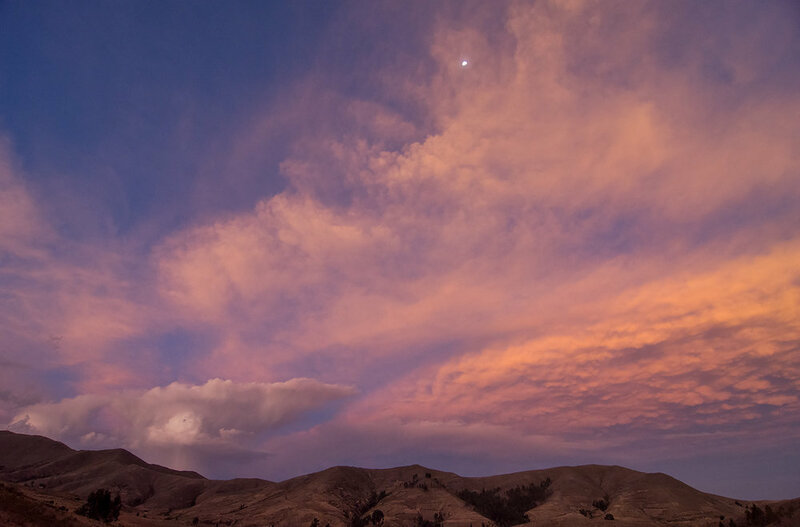 The thunderhead, the mammatus clouds, and the high clouds strung up towards the moon all faded into the night at different rates. At this elevation we were closer to those high clouds as well. This is what “big sky” actually means. Really, the best way to capture the entirety of it was with a fisheye lens. Two hours after the sun finally set, we reached Sucre. We didn’t have time to go out with Jonathan like we had originally planned, just enough to get dinner and local beer at a bar and get to bed. The next day was all about staging, and the best of Bolivia was yet to come.